Yesterday afternoon when I went out to check on the new mom and her twins, I found another ewe on the ground groaning and stretching out her neck. Since my ewes generally just pop out the lambs without any fuss, this concerned me greatly. As I let myself into the sheep pen to check on her, she heaved herself up and out came a lamb. This ewe was large enough that I was sure she was carrying twins so I waited for the second lamb . . . and waited . . . and waited. I did some chores while keeping an eye on the ewe, hoping I wouldn’t need to intervene. The ewe was up and cleaning off her lamb with no signs of a second lamb. She’d occasionally paw the ground and circle – both signs of delivering – but then go back to cleaning off her lamb. I was getting ready to go into the house and grab my lambing supplies when she finally laid down and delivered a second lamb. I let her clean both off before I weighed and dipped cords, but when I finally weighed both lambs I understood why she seemed to be having more problems than usual. 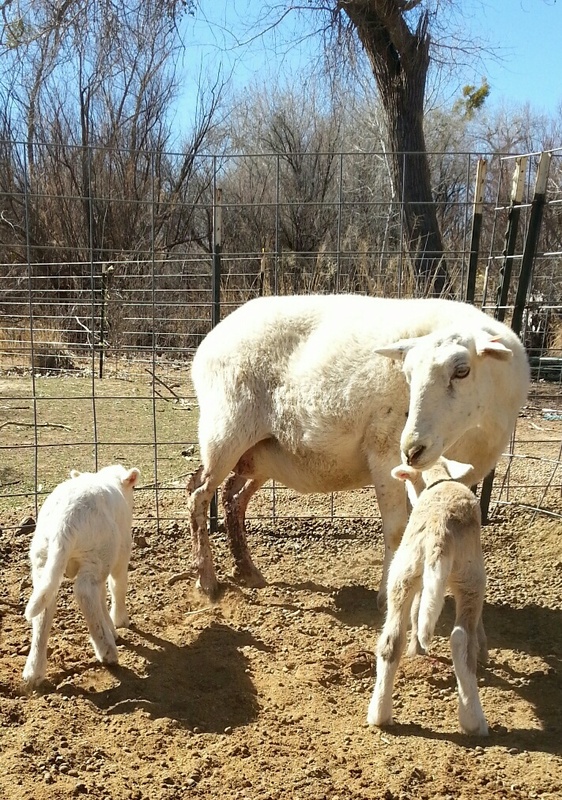 Lamb number one was a 13 lb male and two was a 12 lb male. Here they both are a day later (today). The largest is tan. I’ve had more color show up in this year’s lambs which is interesting because the ram was white. This entry was tagged Lambs, Sheep. Bookmark the permalink.